Enjoy your time off, Didi! Thank you very much, dear Amira – jorney starts in 20 minutes. Its indeed a beautiful island with more than 5000 different plant forms. Yes, we had a great time under a warm sunshine up to 27 degrees. Have a safe, fun and enlightening trip Didi! Sending you a BIIIIIG hug! Now I am back to the winter (on this island there was already 27 degrees). Welcome back, Didi. 🙂 Wow, 27 degrees sounds cold! Nice weekend to you and All! Yes, this trip to the Caranian Island was really relaxing. The sun embraced me with its warm sun beams. I’m so glad you had a great holiday Didi and the sun embraced you with its warmth. Hugs, love blessings to you my dear. It was indeed a very nice trip under a warm sunshine of up to 27 degrees – but now I am back to Finnish winter with lots of snow and frost. Have a wonderful time, Didi! Enjoy yourself, rest, relax and get inspired! Ha! 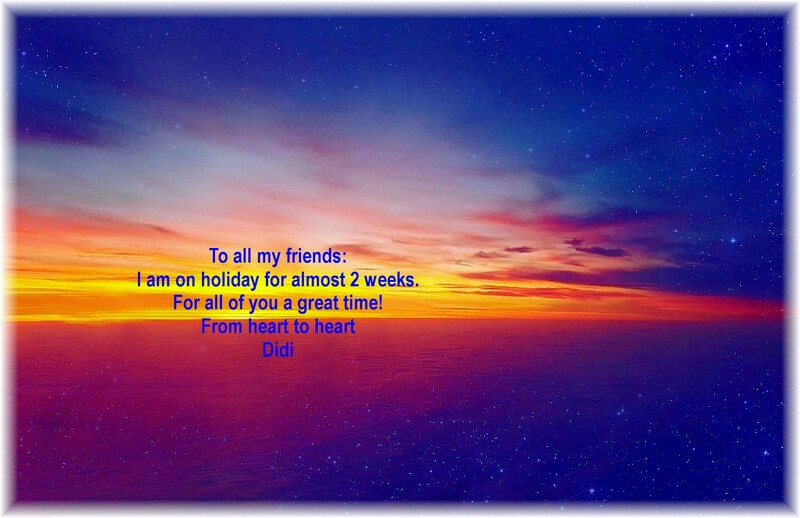 Blessings to you, Dear Friend – Be safe!! I was really missing you.